Three-storey house with two apartments, in an elevated and secluded position, surrounded by mountains and forests, 8 km from Pisogne, 700 m above sea level. The house has a common ground of 7000 m2 with lawn that degrades on a slope, where is housed an above ground pool (6 x 4 meters), and a gazebo. On the ground floor of the house there is a common area with washing machine and bike storage. The apartment has a large balcony with table and chairs from which you can admire a beautiful view of the mountains, woods and lake. 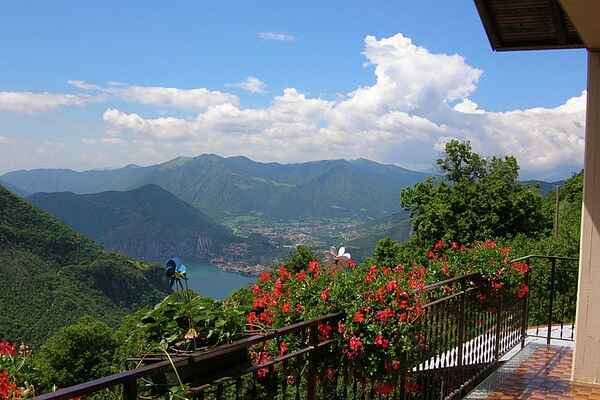 The house is situated along the last 8 km uphill road with hairpin turns, running through the mountain offering wonderful views of the lake. The last 100 meters are made up of a steep ramp up, passable by car (pay attention). The apartment consists of entrance hall, kitchen, living room with two beds, two rooms with a double bed each, a bedroom with a double bed and a single bed, bathroom with tub. WI-FI Internet access up to 500 MB of use. The lake is best known for its automobile-free island, called Monte Isola. Val Palot (closest location for winter sports) 12 km. The beatiful town of Bergamo 40 km.